In partnership with Globe Telecom, Cherry Mobile launches their latest product called Cherry Prepaid SIM. From mobile phones they now jump to telco related products which will also match on the industry they are known for. You can now get and inquire this SIM card at your nearest Cherry Mobile kiosks and stores. This SIM also comes with bundled phone for 999 pesos you’ll get one Android Cherry Mobile Astro smartphone. If you want a basic call and text phone with Cherry SIM, you can get LITE bundle that includes CP1 Bar phone with SIM plus the bonus loads for only 399 pesos. How much is Cherry Prepaid SIM? Just an update to those who want to buy a new SIM, Cherry Mobile now offer the new Cherry Prepaid LTE SIM for only Php29.00 also. 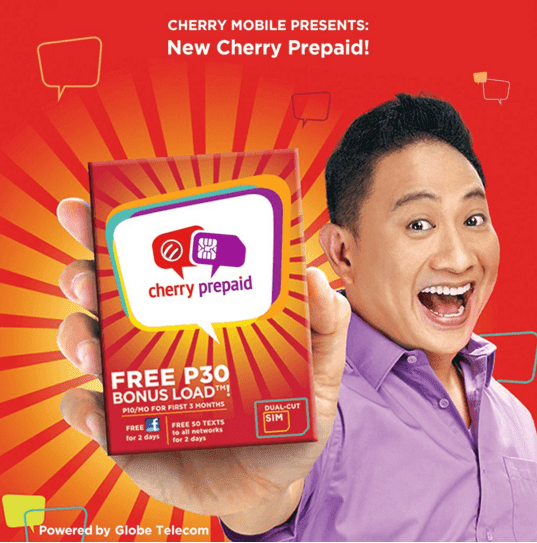 For the suggested retail price of 29 pesos you can get Cherry Prepaid Sim plus 30 pesos bonus load good for 3 months (P10 per month). You’ll enjoy free Facebook access and 50 texts to all networks good for 2 days. You can also enjoy the same promo offers from current telco, from calls, texts and data or internet promos you’ll have that with this SIM. Where to Load Cherry Mobile SIM? You can load at your nearest Cherry Mobile and Globe Telecom loading outlets. It will soon be offered on your nearest load retailer and sari sari store so no need for you to worry on reloading your account to register promos. Have you tried this SIM already? Bakit ung cherry sim ko di matawagan pag unli ako sa tm?diba globe ung sim na yon?